IBM (NYSE:IBM) has been focusing on its strategic imperatives segment to drive the next level of growth. The segment includes the cloud, analytics, mobile, social, and security services. But the turnaround is taking a lot longer than expected. After three consecutive quarters of revenue growth, IBM revenues seem to be back on the decline. In an earlier streak, IBM had reported revenue declines for five straight years. The market is losing patience and post the result announcement, IBM's stock fell 2% in the after hours trading session. Revenues for the first quarter fell 4.7% to $18.18 billion, missing the Street's forecast of $18.46 billion. Its net income also declined to $1.59 billion, or $1.78 per share, compared with $1.68 billion, or $1.81 per share, a year earlier. On an adjusted basis, IBM earned $2.25 per share and was ahead of the market's expectations of $2.22 per share. IBM attributed the miss in revenues to its declining hardware business and currency headwinds. By segment, cognitive solutions and technology services and cloud platform revenues came in at $11.91 billion, falling short of the market's expected $12.43 billion. 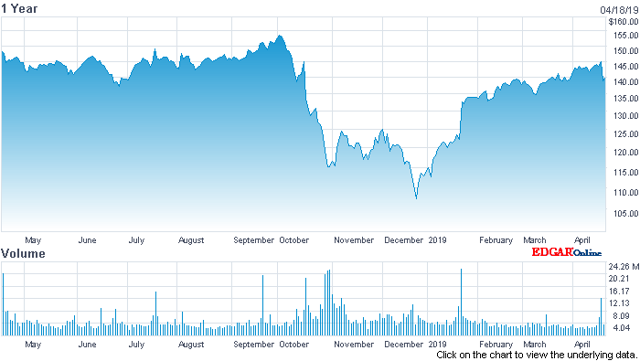 Within the segment, cloud and cognitive solutions revenues, which include analytics, cybersecurity, and artificial intelligence, fell 1.5% to $5.04 billion, but managed to beat the analyst estimates of $4.18 billion. Global business services revenues were flat at $4.12 billion and also fell short of the analyst estimates of $4.19 billion. Systems revenues fell to $1.33 billion, missing the market's forecast of $1.37 billion. It ended the quarter with global financing revenues coming in flat at $406 million. IBM is divesting some of its other businesses such as the mortgage servicing business. It reported revenues from these segments as part of Other revenues that ended the quarter with $417 million. IBM did not report the revenues from its strategic imperatives. But it did mention that the annual exit revenue run rate for cloud-delivered services increased 10% to $11.7 billion. IBM expects to end the current year with EPS of at least $13.90, which was short of the market's forecast earnings of $13.91 per share. IBM has been pushing forward on its platform and cloud-driven strategy. Its Platform as a Service offering, formerly known as Bluemix, is now known as the IBM Cloud. Bluemix was released in 2014 and within a year it had a suite of more than 100 cloud-based development tools. Today IBM's Cloud Foundry is the open-source PaaS offering on IBM Cloud that enables organizations to deploy and scale apps. IBM allows organizations to run the Cloud Foundry apps on a public cloud, enterprise environment or a private cloud. The Cloud Foundry now has thousands of applications that provide capabilities such as compute, storage, networking, analytics, and IoT. A recent report by Transparency Research estimates the revenues form IBM Bluemix services to grow to $38.85 billion by 2026, growing at an annualized growth rate of nearly 25% over the next seven years. Besides PaaS, IBM is driving its cloud business through various innovations. Over the past few months, IBM has been investing in adding capabilities such as cloud migration services and cloud optimized systems. During the last quarter, it introduced Watson Anywhere that makes IBM Watson available on-premises and on any private or public cloud. It released the IBM cloud integration platform that provides a standard way to integrate services and applications across multiple cloud environments. IBM's cloud business also is expected to get a strong push from its $34 billion acquisition of Red Hat. IBM plans to leverage the acquisition to help its clients shift their business applications to hybrid cloud, while addressing the issues of portability, management consistency and security. The acquisition is still pending regulatory approval, but IBM plans to complete the acquisition by the second quarter of the year. IBM will need to continue to push its cloud and platform strategy to deliver the much-needed turnaround. I would like to know from IBM what apps on its platform does it see as delivering the most traction? What are the apps that IBM developers need to focus on to drive more revenues? Which of these apps and its developers do you think IBM should acquire? IBM's stock is currently trading at $139.11, with a market capitalization of $123.8 billion. It touched a 52-week high of $162 in September last year. When the tech stocks tumbled last December, its stock too had fallen to a 52-week low of $105.94.